An aerial view of the Pantheon Park site in Wolverhampton. © Stoford Developments. 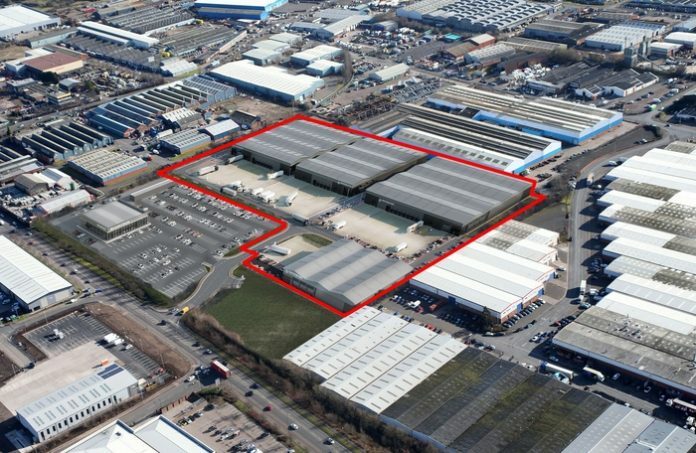 A multi-million-pound scheme of four industrial/warehouse units in Wolverhampton has been unveiled by leading commercial property developer Stoford Developments (“Stoford”) and Bridges Fund Management (“Bridges”). Stoford and Bridges have submitted a planning application to the City of Wolverhampton Council to build four high-quality units at Pantheon Park of 30,000 sq ft, 59,050 sq ft, 68,830 sq ft, and 82,850 sq ft, each with integral offices, parking provisions and service yards with institutional dock/level access. The development is expected to generate significant opportunities for new local jobs and stimulate further inward investment into the area. Pantheon Park is an 18-acre site in Wednesfield Way, Wolverhampton, which is ready for construction to begin following an extensive programme of remediation and demolition. Work could start on site in January once detailed planning consent is achieved, with practical completion proposed for Q3 2019. This announcement follows the recent planning consent granted for one of the UK’s leading car dealership groups to create a major new car sales site at Pantheon Park. The extensive remediation work has been supported by a loan of over £2 million by the Black Country LEP. Stoford’s development manager Angus Huntley said: “Our proposals represent a high-quality development of four industrial/warehouse units which will help to promote and support employment growth and stimulate economic investment in the area. Pantheon Park is close to the M6 Toll, M5, M42 and M54 and is situated in an established location off junction 10 of the M6 via the A454.